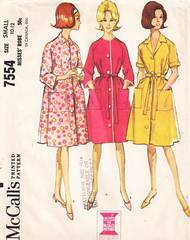 Front buttoned robe, with or without collar, has short cuffed or 3/4 length raglan sleeves and patch pockets. Optional tie belt and trim. Misses' Size Small; Bust 31-32; Waist 24-25; Hip 33-34.